This baked pasta dish is a fun twist on lasagna. 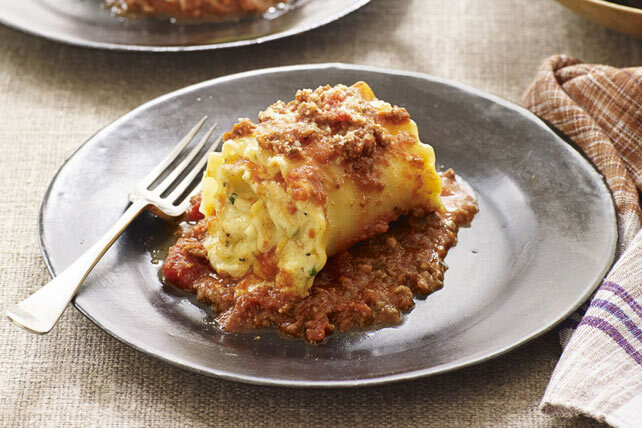 Traditional ingredients, such as ground beef, pasta sauce and creamy cheese, get wrapped up in lasagna noodles and baked until bubbly. Brown meat with garlic in large skillet; drain. Return meat mixture to skillet; stir in pasta sauce, tomatoes and 1/4 cup Parmesan. Mix eggs, milk, cream cheese product, shredded cheese and parsley until blended. Spoon half the meat sauce onto bottom of 13x9-inch baking dish sprayed with cooking spray. Spread each noodle with 3 Tbsp. cheese mixture; roll up. Place, seam sides down, over sauce in dish; top with remaining sauce and Parmesan. Cover. Bake 45 to 50 min. or until heated through. Omit 2 of the garlic cloves, and prepare using Philadelphia Herb & Garlic Cream Cheese Product. Chopped fresh basil for the parsley, and/or use a mixture of both fresh herbs.